Montrealers did not get as much snow as forecasters expected Tuesday, but road conditions still forced the STM to reroute bus lines to avoid some steep and slippery hills. Montrealers did not get as much snow as forecasters expected Tuesday, but road conditions still forced the city's public transit authority to reroute bus lines to avoid some steep and slippery hills. The STM had to reroute the 11, 107 and 144 bus routes. 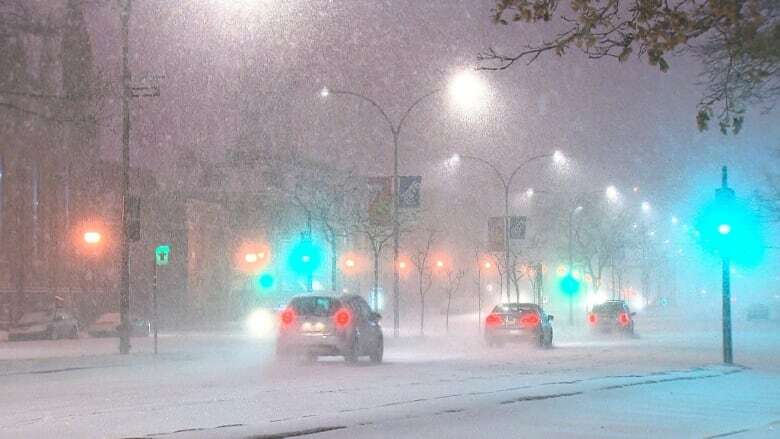 About 12 centimetres of snow had been expected, but by 7 p.m., only about three centimetres had fallen on the island of Montreal — the heaviest snowfall bypassed the metropolis and fell north and east of the city. More is expected overnight, however, with up to 10 centimetres more in the forecast for the Montreal area. "We open the door to cold weather over the next few days," said CBC Montreal weather specialist Jeff Harrington. Temperatures are expected to reach a low of –19 C Wednesday. Montreal Mayor Valérie Plante said Monday that the city was ready for the snow. "We have been putting all the resources — whether they are financial or human — where they are needed, and we are hoping to have everything done before we have the new snowstorm," Plante said Monday. Plante's administration faced criticism from the opposition at city hall over its snow-clearing efforts so far this winter. Ensemble Montréal leader Lionel Perez said the city failed to call clearing operations early enough and devote the resources needed to handle previous snow and ice accumulation. "There's tons of ice still on many parts of our city and it's simply unacceptable," Perez said. Plante countered that the opposition "doesn't really know how to criticize us." According to Plante, the ice Perez highlighted was formed by a period of rain and milder temperature Montreal experienced. "It's not an excuse, just a reality," she said.